Company Overview - Shenzhen Young June Technology Co., Ltd.
8YRSShenzhen Young June Technology Co., Ltd.
Shenzhen YoungJune Technology Co., Ltd. was founded in 2009, producing healthy e-cigarettes-electronic cigarettes, cigarette holders and electronic cigars and specializing in integration researching, production, sale and service, and is a Sino-foreign joint venture. We have gathered lots of well educated and experienced researchers and administrators on electronic cigarette field. We have been devoting ourselves to developing healthy and safety electronic cigarette all the time, and our products are outstanding in the industry because of innovative and high technology, advanced technique and perfect management. New technology and guaranteed quality ensure the strong and powerful corporate image, and the influential position of the industry. 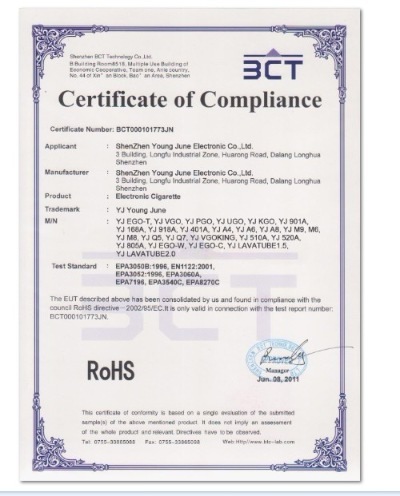 For several years, Young June Team has been devoted all the efforts and energy to enlarging the process scale and innovating the technology, insists on providing customers with electronic cigarettes via excellent quality, competitive price, punctual delivery time, perfect service. We believe the low cost, high quality, new eidos and finer service are the bases of a developing enterprise. After several years' development on electronic cigarettes, we keep making visible and invisible investment for it, including developing new technique, controlling quality, improving service system, seeking customers' satisfaction, analyzing the market situation. We own high standard quality management system and good production and office environment. Advanced technique and instruments ensure our production quality according with international standards. Underpinned by the strategy of "Good faith, unique design, excellent quality and perfect service", we keep putting out various new and high-class electronic cigarettes while constantly bringing forth new ideas. Our main business partners are from Europe, Asia, North America, Africa and other countries and regions in the world. 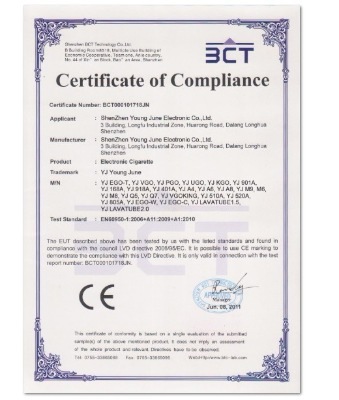 We are always one of the most popular Electronic Cigarette manufacturers in the whole world!